Richard Glossip execution can happen Wednesday, appeals court rules. 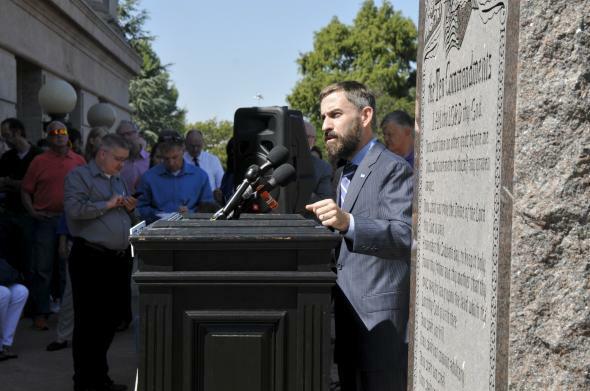 Oklahoma ACLU executive director Ryan Kiesel speaks on Sept. 15, 2015, in Oklahoma City to demonstrators protesting Richard Glossip’s scheduled execution. But two judges dissented, writing that the evidence against Mr. Glossip, 52, was weak. Glossip was convicted of plotting a 1997 murder based largely on the testimony of Justin Sneed, who has admitted to carrying out the killing. Substantial evidence indicates that Sneed is an unreliable witness who was coached to testify against Glossip. Robert J. Smith wrote Monday in Slate that Glossip’s potential execution is only one of three morally questionable death penalty sentences that may be carried out this week, also citing the cases of Georgia’s Kelly Gissendaner (who since her conviction has become a minister who has helped rehabilitate a number of other women) and Virginia’s Alfredo Prieto (who has spent seven years in solitary confinement and has a very low IQ).